The Bleeding Heart Family East of the Cascade Mts. Some taxonomists now include this family as part of the Poppy family or Papaveraceae. Golden Corydalis, Golden Smoke, Scrambled Eggs: Corydalis aurea ssp. aurea (Synonyms: Capnoides aureum, Corydalis aurea, Corydalis aurea var. aurea, Corydalis aurea var. occidentalis, Corydalis aurea ssp. occidentalis, Corydalis washingtoniana) - Flowers not flattened, with only 1 spur at the base. Plants 10-40 cm tall. Flowers yellow, 12-18 mm long in a few-flowered raceme. Case's Corydalis, Cusick's Corydalis, Cusick's Fumewort: Corydalis caseana ssp. cusickii (Synonyms: Corydalis caseana var. cusickii, Corydalis cusickii) - Flowers not flattened, with only 1 spur at the base.Plants 50-100 cm tall. Flowers creamy or white, 20-25 mm long, arranged in a many-flowered raceme or panicle. 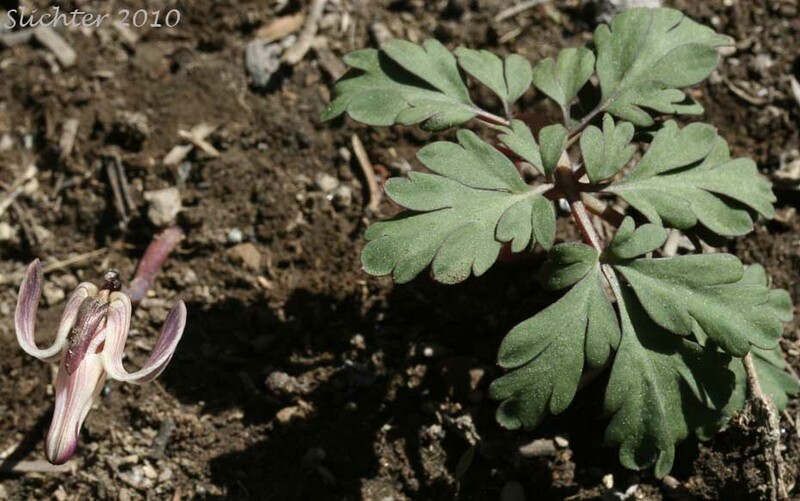 Scouler's Corydalis, Scouler's Fumewort, Western Corydalis: Corydalis scouleri - Generally a west Cascades species, evidently a population has been found near the head of the North Fork of the John Day River. Dutchman's Breeches, Dutchman's-breeches, Western Dutchman's Breeches: Dicentra cucullaria (Synonyms: Bicuculla cucullaria, Dicentra cucullaria var. occidentalis, Dicentra occidentalis, Fumaria cucullaria) - Flowers flattened with 2 spurs at the base. The 3-10 flowers are white or pinkish, pendulous and arranged into a loose, terminal raceme. Oregon Dicentra, Pacific Bleeding Heart, White-flowered Bleedingheart: Dicentra formosa (Synonyms: Dicentra formosa ssp. formosa, Dicentra formosa var. brevifolia, Dicentra formosa var. brevipes) - A species typically found from the Cascades westward, a population has been found in the Ochoco Mountains. One-flowered Dicentra, Longhorn Steer's-head, Long-horn Steer's-head, Steer's Head: Dicentra uniflora - Flowers flattened with 2 spurs at the base. Flowers solitary and white to pinkish, 12-15 mm long.